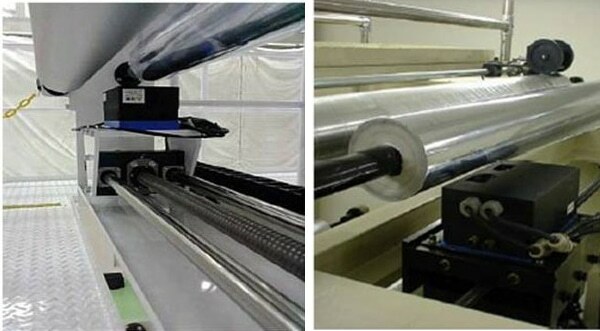 The WebControl Coat Weight Measurement System uses infrared technology to read in real time the adhesive coating weight being applied on printed, aluminum or metalized films, with a precision of 0.01 g/sqm. Thickness variations in the substrates have no effect on the reading. The system detects wrong mixing ratio which can affect bonding strength, often recognized just after curing of adhesive. First infrared rays are irradiated towards the coated section. The infrared absorption for each specific wavelength occurs in relation with the thickness of the coated section. The range or deepness of the wave will determine key parameters. The amount of this absorption is determined from the transmitted light or mirror-reflected incident light. The relational expression for the previously obtained absorbance and moisture value is then used to calculate the thickness. Our original P-polarized incident light technology is used to eliminate errors from surface reflection or internal multi-reflection. This provides the ideal hardware for a infrared thickness meter. MONITOR PRODUCTION With on-line measurement, it is possible to continuously monitor production. IMPROVE PRODUCTION EFFICIENCY Shorten the confirmation time before production. REDUCE COSTS Find out the quality problems in time to reduce the lot loss.Early detection of quality problems will reduce material loss and customer returns.